At last count four cars from the Lambrecht Chevrolet Auction held last week, have surfaced on the Internet for resale.Â You had to figure some local shops would take advantage of their location and opportunity to flip a car.Â Of course all these cars are now prominently featuring their connection to the Lambrecht Chevrolet dealership, and sold through VanDerBrink Auctions. One seller found out that his 1969 Kingswood Station Wagon had too much rust in the frame to be unsalvageable.Â Iâ€™m guessing if the car had flat tires and laid down on the dirt, rust would be inevitable.Â Now is the time to see if someone needs just the parts and cut your losses. 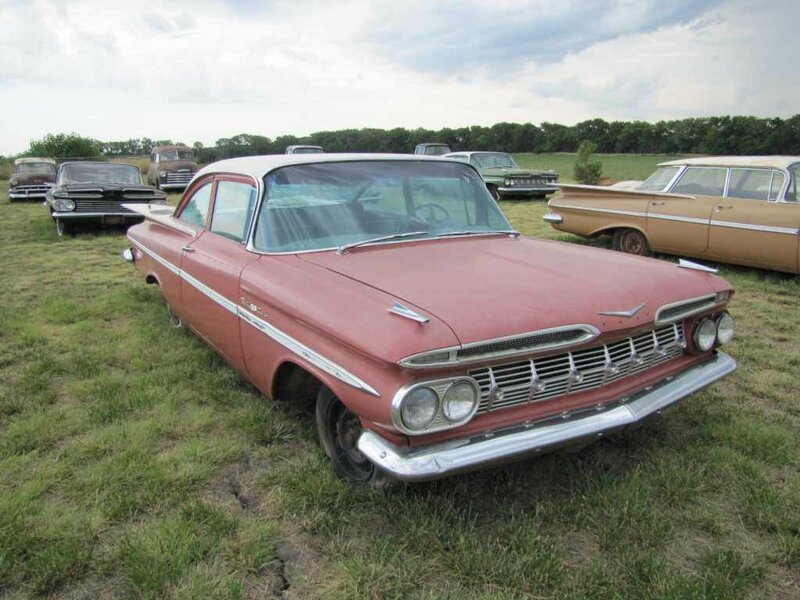 A 1959 Chevrolet Bel Air is being offered with a $25,000 asking price.Â Good profit if it sells, since it was bought at auction for $18,000.Â Itâ€™s a cute car but when the seller/dealer advertises it as a 150/210 AND a Bel Air Hardtop I guess youâ€™d have to do some more research. 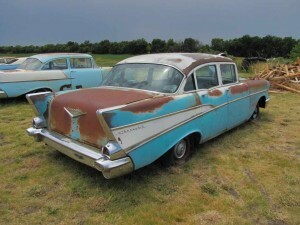 A 1957 Chevy suffers the same identity problem, advertised as a 150/210 and Bel Air.Â So unless Johnny Cash had a hand in it, Iâ€™m guessing it is only one of those three models â€“ and based on the VIN Iâ€™d wager it is the 210 sedan version with four doors, which is two doors too many for my taste. 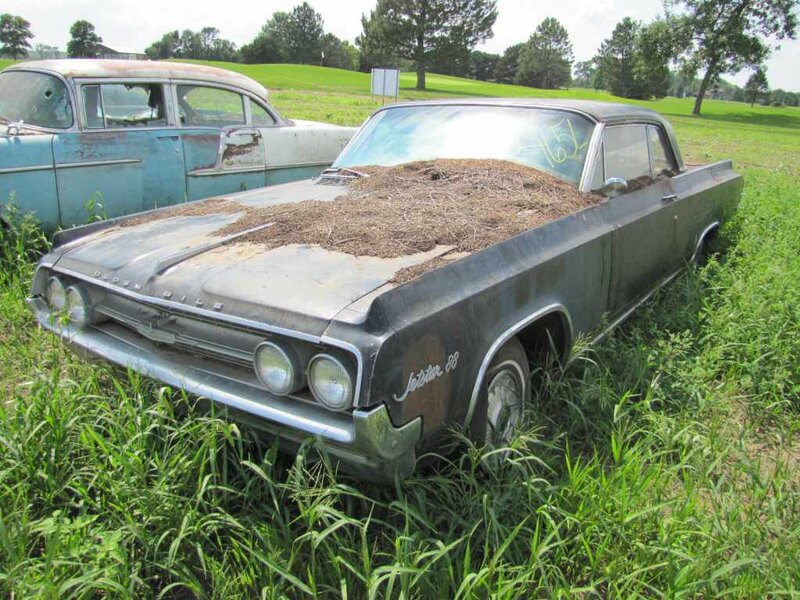 And not just Chevyâ€™s are being flipped.Â One seller is offering a 1964 Oldsmobile Jet Star 88 two door hardtop for sale.Â This seller cleared off some if the dirt and dust, but you canâ€™t deny it is rough. Lots of people have looked at these cars and the prices paid and scratched their head.Â The mileage is relatively low for fifty + year old cars, but they are in rough shape; even the â€œflippersâ€ havenâ€™t generally tried to start or verify the running condition.Â In this shape, you can try to get them in running condition and then enjoy the look and notoriety.Â But if you were planning on a full out restoration you better open that checkbook wide and start adding some zeroâ€™s, because lots of parts are missing and torn up. I have mixed feeling on flippers.Â They serve a purpose and Iâ€™m all for making a buck.Â For someone who didnâ€™t want to bid on line and couldnâ€™t make it out to Pierce, Nebraska, they can still buy a rusty Chevy.Â I just think that these flippers needlessly raised the prices up and now need even more of a price increase in order to make a profit. What do you think, are flipperâ€™s a miracle or menace? The VanDerBrink Auction of the Lambrecht Collection of classic Chevroletâ€™s is a week old and reality is crashing through the buying fever.Â The crowds have departed Pierce, Nebraska and we can now look more analytically at the cars and prices paid. The auctioneers at VanDerBrink did a great job in organizing these cars and gave fairly valid descriptions of the cars.Â Some were mislabeled as Bel Air models but all auction houses note that descriptions are guides and not to be relied on.Â With this many cars, some minor issues are bound to occur and VanDerBrink did a great job keeping the crowd orderly and advancing.Â Plus the sellers, the Lambrecht’s, must be happy with the outcome and know their name will be now known in collector circles for years to come. a survivor mode.Â Remember they can only be original once! All prices will have a buyerâ€™s premium of 5-10% added to the listed price, based on whether the bidder was on site or not. For the 1955 model year, six sold cars were four doors and four were the more in demand 2 doors; both a hardtop and a sedan.Â While perhaps more practical if you are planning on using the rear seat often, the reality is the 2 doors are always more in demand in the collector market and generally higher priced when restored.Â The 2 door sedan (post) went for $5,750 and the hardtop went for $9,000.Â There were no high dollar sales for this year with the range being from $12,000 to $1,800.Â The ten cars sold for an average of under $5,200Â Â Plus none of these cars were the low or no Â mileage; sold on MSO (Manufacturerâ€™s Statement of Origin) paperwork instead of state title; which indicates that Lambrecht Chevrolet didnâ€™t have any trouble selling those models when new! At least at these prices, the cars are going to loving homes and not being chopped up for their body parts.Â Or are theyâ€¦check out a future blog article. This past weekend the Lambrecht Chevrolet auction was held in Pierce Nebraska by VanDerBrink Auctions.Â If you hadn’t heard about this nearly 500 car auction in advance, you missed out on a surely once in our lifetime event.Â It seems the mom and pop owners of Lambrecht Chevrolet had a history of keeping both new cars that just didn’t seem to move off their lot; or some cars that they took in as trade ins. Some of these cars were kept in fields, some were stored in warehouses until literally the roof fell in and some were kept at the Lambrecht dealership showroom.Â Â Â Well the cars weathered and finally the surrounding trees were chopped down and the cars were offered up for sale this past weekend (September 28-29, 2013).Â Even the History Channel got in the act and offered coverage from the farm fields. These Lambrecht Chevrolet vehicles were generally what I would call rough, survivor cars.Â They were stored outside, after all, and exposed to Mother Nature.Â Even the better vehicles were bound to need some work.Â You can’t ignore a vehicle for fifty plus years and expect the radiator, belts, brakes and even engine to be road worthy. VanDerBrink auctions seemed to have a good handle on this auction. Bearing in mind that they are not a usual purveyor of high-end collector cars, they had things well in hand.Â This wasn’t their first rodeo!Â Parking was available nearby and while probably high by Pierce, Nebraska local standards, $20 seems a fair deal given the circumstances.Â Their website stayed up and had generally accurate descriptions and pictures of the cars.Â They had plans for temporary storage of the cars, since most had no functional tires! 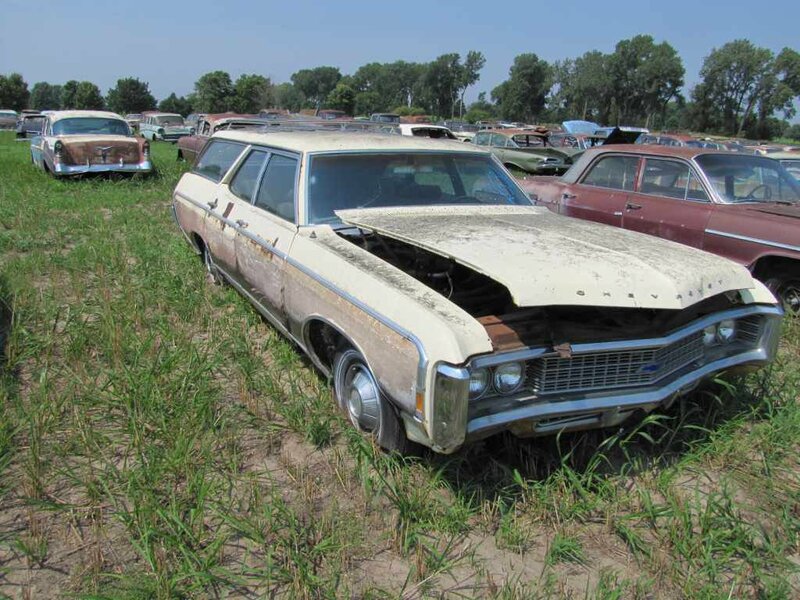 Most of the low mileage “new” cars were offered with Manufacturer Statement of Origin (MSO), meaning that the cars never were sold and titled in the state.Â A few cars were noted as being issued a Nebraska title, which I took to mean the MSO wasn’t located.Â And the balance of the nearly 500 cars were used vehicles, generally with 50,000+ miles on the odometers.Â It indicates the organizational skills maintained by a small dealership like Lambrecht had, to locate MSO’s from sixty years ago!Â I know some owners with one classic car that can’t find their titles! The value in these cars was the low mileage status of them.Â They are survivors and few and far between.Â To quote the pundits, “they are only original once.”Â But many buyersÂ were quoted as indicating they had plans of fixing up the cars and driving them.Â But once you start putting miles on these cars, their provenance drops. 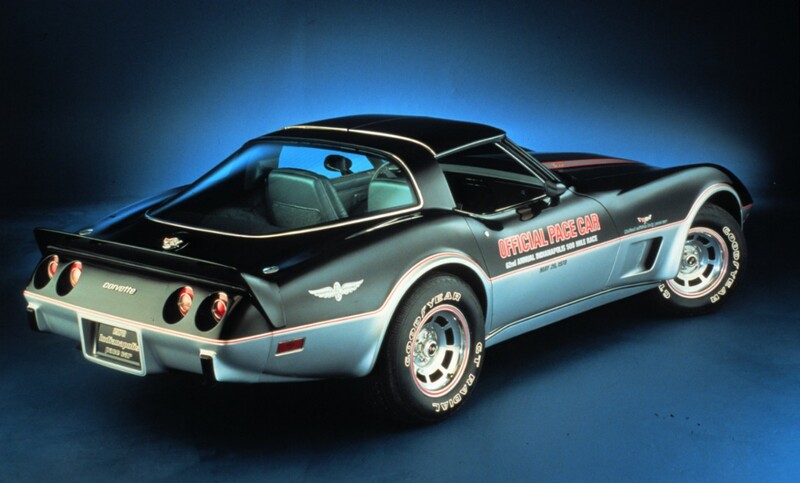 As a comparison, the Barrett-Jackson auction has sold three low mileage similar Corvettes.Â In 2011, they sold a 1978 with only 48 miles for $45,100.Â More recently in January 2013 Barrett-Jackson sold one with 158 miles for $44,000 and in Spring, 2013 at Palm Beach a coupe with 928 miles sold for $33,000.Â So the Lambrecht version had probably a $40,000 premium for those four miles. The best news is that nearly 500 cars have found new homes and were saved from the metal shredders.Â And for that we all should be grateful!